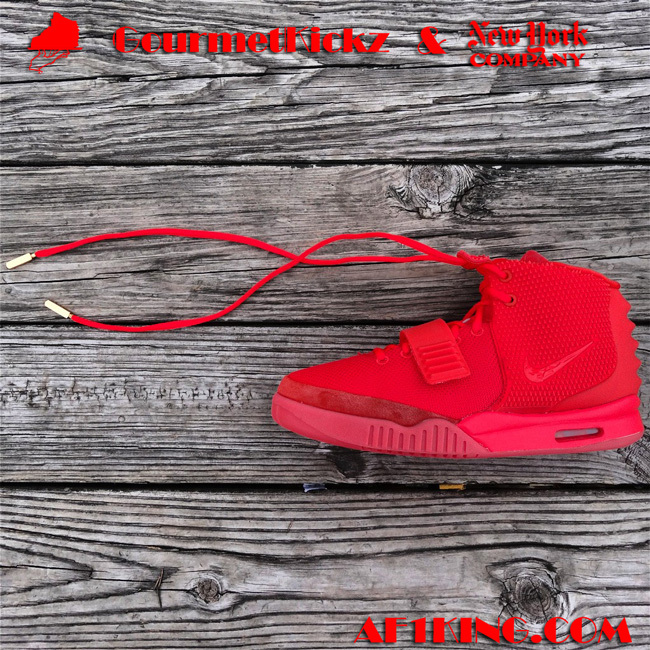 GourmetKickz has partnered with famed Ebay seller NewYorkCompany to list a size run of the elusive and as of yet never-to-officially-release “Red October” Nike Air Yeezy 2. These pairs are among only a very few true authentic pairs that have surfaced. Below you will find some images that will help you identify these as real versus the fakes that many Instagram account owners are posting. The first tell tale sign of authenticity is revealed upon close inspection of the spiked sidewall textile. The fake versions have no knit underlay, the underlay is a smooth material whereas authentic pairs have a knit underlay. Authentic pairs also have a swoosh that favors the Diamond style check of the LeBron X, whereas fake Yeezy2 Red Octobers have a simpler swoosh that resembles carved out triangles on the surface. After the jump check out some reference images from one of the first friends of Nike to be seeded a pair and feel free to purchase an authentic pair here for a cool $12K! Yep, 12 stacks….. that is apparently the market price for the world’s most anticipated sneaker release, never to release.